"When things go the wrong way, we always depend on our family." This is exactly the theme of the latest action-drama movie from Hollywood entitled, "American Heist". The movie is released exclusively in the Philippines by CrystalSky Multimedia. The movie stars Academy Award Winner Adrien Brody and Star Wars alumnus Hayden Christensen as the estranged brothers Frankie and James, respectively. The "American Heist" movie brings us back to the old-fashioned way of movie making --- with no special effects and CGI's, less glamorous set designs and costumes, and less number of actors and actresses (but also critically-acclaimed and most recognized in their fields), and also tackles a superhero genre in the persona of an estranged brother. While almost every movie producer invest on superhero films, the production studio of "American Heist" invested on something more radical and has more human-like experience in a gothic environment. However, these reasons are also the downfall of this movie. People nowadays like to be entertained and inspired with superhero movies, which make them feel good as they exit the moviehouses. The movie "American Heist" does not really give you that feeling of being inspired and does not give you the entertainment value that you need, but only a reality check of the socio-economic status not only in the sub-urban settlers in the US but also maybe at some point in our lives or in our country as well. In the end, choosing the right path is always the right and only correct answer that matters. The word "family" may have been abused several times in this movie, but we can't really deny the fact that they are always the last persons on Earth that we can asked for help in times of trouble. Reality check, some superheroes are in the form of family members. In the end, it's up for the moviegoers if this "American Heist" movie is a "make it" or a "break it" in the movie scene. The plot itself would tell you that the movie's story is also somewhat predictable. Towards the end, you'll realize, Hayden Christensen's acting has improved and becomes mature. "American Heist" movie will open next week, July 29 in the Philippines brought to you by CrystalSky Multimedia. 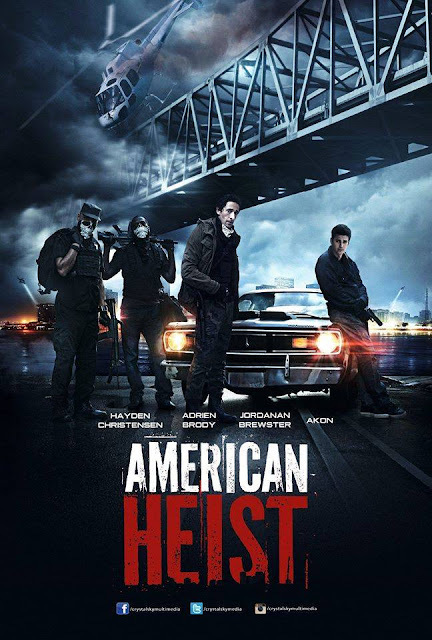 Watch "American Heist" full movie trailer below. SM MOA, SM Megamall, SM San Lazaro, Sm Sta Mesa, SM North, Sm Manila, Sm Marikina, SM Cauayan, Sm Fairview, SM Bacolod, SM Cebu, SM iloilo, Sm Davao, SM Lanang, SM Southmall, Teatro De Dapitan, Remar Cubao, Cinerama Recto, Sta Lucia, Greenhills, Gateway Cineplex Cubao, Gaisano CDO, and Gaisano Iligan.